It’s not optional. All employers must comply with OSHA standards. The Occupational Health and Safety Administration (OSHA) has made it their mission “to ensure that employees work in a safe and healthful environment.” The organization exists to “keep workplaces free of serious recognized hazards.” This administration’s existence makes OSHA consulting firms essential. Why? OSHA consulting firms provide a proactive approach to adhering to OSHA standards. Businesses that partner with an OSHA consulting firm are making a smart, strategic move to align themselves with OSHA regulations and prevent penalties. How can an OSHA consulting firm help your business? As experts in OSHA regulations, these firms provide the services needed to adhere to current safety laws. Since OSHA violations result in severe penalties including thousands of dollars in fines, obtaining these services is well worth the investment. The OSHA consulting firm will partner with you to develop and implement environmentally responsible business practices. Their solutions should include everything you need to address all safety and environmental concerns and avoid any OSHA charges. To accomplish this, a comprehensive OSHA consulting firm offers the following services. Phase I and Phase II Environmental Site Assessments are crucial to adhering to OSHA standards. These assessments identify potential contamination on the property and traces issues to the responsible parties. When this process is completed, you are protected under the “innocent landowner defense.” The OSHA consulting firm’s process should satisfy the All Appropriate Inquiries in accordance with ASTM 1527-13. This due diligence should include thorough research into the property. The OSHA consulting firm will conduct personal interviews, perform on-site reconnaissance and study the property’s historical information. The resulting assessments protect you and your company from fines related to environmental safety concerns. The presence of hazardous materials such as asbestos can quickly put a company in violation of health and safety laws. An OSHA consulting firm offers trained professionals to provide asbestos services. These experts provide evaluations, abatement, and professional reporting to ensure your settings align with OSHA regulations. Proper waste management and disposal is key to maintaining a safe work environment. OSHA consulting firms identify the best methods for these tasks to establish healthy procedures and keep your costs to a minimum. Their input can also help develop new sources of revenue, transforming cost-draining streams into revenue streams. OSHA is a federal administration. Many states also have OSHA-approved plans that cover local workplaces. Others have state-specific organizations that uphold standards which relate to OSHA regulations. In Ohio, the Bureau of Underground Storage Tank Regulations is one of these organizations. In addition to the four federal OSHA offices that oversee health and safety standards throughout the state, this bureau maintains requirements of property owners to address contamination and protect groundwater resources. OSHA consulting firms remain current on all BUSTR requirements and work with businesses to assess related subsurface conditions. These firms provide site investigations, UST removal and remediation plans. Their efforts ensure a company’s projects remain both OSHA and BUSTR compliant. As you choose an OSHA consulting firm, look for a company that provides comprehensive services. The firm should be proficient in all areas of environmental risk to ensure your projects and ongoing operations fully adhere to OSHA standards. A solid OSHA consulting firm will offer seamless services to meet these environmental objectives effectively and efficiently. ENVi Environmental offers a suite of services that delivers comprehensive coverage of OSHA related issues. 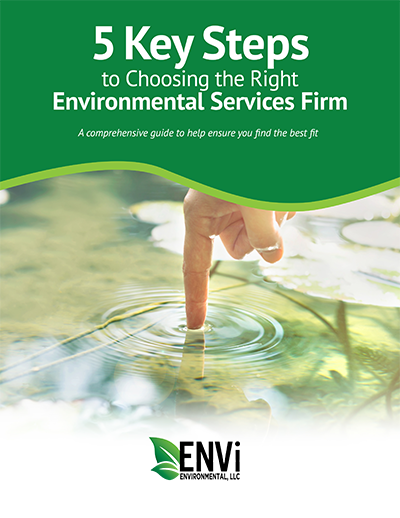 ENVi Seamless: Professional services that include all environmentally-related offerings, from evaluation and assessment to abatement and remediation. ENVi 360™ Solution: Covers the full spectrum of services, meeting the needs of complex projects from start to finish. Personnel: Professionals who are certified and specialize in OSHA training, asbestos, and hazardous waste. Assessments: Detailed assessments and reporting that are compliant with the ASTM 1582-13 as standard practice. Experience: More than 30 years of local experience; Services based on in-depth knowledge of OSHA regulatory requirements in Cleveland.